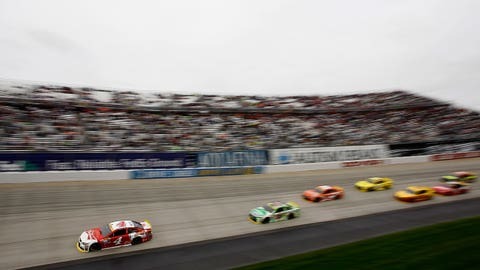 Kevin Harvick dominated Sunday's Chase elimination race at Dover International Speedway, advancing to the Contender Round with a statement win. Obviously what Joe Gibbs Racing was hoping for coming out of Dover was that Kevin Harvick would have been knocked out of the Chase. That didn’t happen, as Kevin has now won his third elimination race in his last five Chase races. Obviously Kevin is still going to be a major player going forward, but I don’t think JGR can turn their back on the other seven teams also still in the championship hunt. If I were them I’d be worried about Dale Earnhardt Jr. because he can be pretty dangerous these next three races. This next round is made up of Talladega Superspeedway and two one-and-a-half mile tracks. His mile-and-a-half performance the first part of the season was pretty darn good and remember that was under the same rules package they are under now. I’m sure part of the reason that Matt Kenseth stayed out on that one caution Sunday at Dover was to see if maybe they could do something to pin Harvick down. Sure, they wanted to win the race but maybe if something falls their way then someone else could win preventing Kevin from going forward. Unfortunately for them, that didn’t happen. Again, I don’t want to seem like I am short-changing the other seven drivers, but right now today it seems to me it’s going to be Joe Gibbs Racing versus Kevin Harvick for the 2015 NASCAR Sprint Cup championship. Remember, it was Kevin that said he was going to pound JGR into the ground. Now it didn’t happen that way in the first two races of the Challenger Round, but it sure did on Sunday at Dover when he led 355 of 400 laps. Sunday was all but flawless for Kevin. He started 15th and took the lead by Lap 24 then never looked back. He’s going to need that kind of performance if he wants to repeat as our Sprint Cup champion.